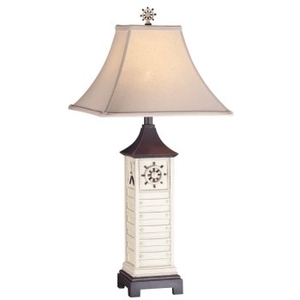 Set sail and steer the ships steering wheel with this nautical table lamp. Rope trimmed frames border the engaging nautical designs ( anchor steering whell and lantern) depicted around the base of the Ocean Antique Lamp. This same rope border is repeated again at the bottom of the lamp base. The nautical decor is also expressed in the lamp finial which is a ships steering wheel. Antique Ocean Lamp is 32.5" tall.